I will always remember the mince pies that my Nana used to make. 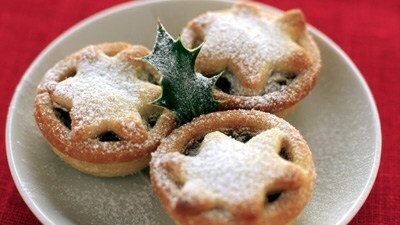 Dusted with icing, each and every one of the were filled to the brim with succulent mincemeat. The trouble is that they were always surrounded by an awful, dry and misshapen pastry case - absolutely horrible! So I only ate them when I was really hungry. The trouble is that as a child I was always hungry. Luckily, this is a recipe that ticks all the boxes, and maybe a bit too well because when you get a mince pie that tastes just right I have a habit of chucking far to many down my petite, yet very manly gob. 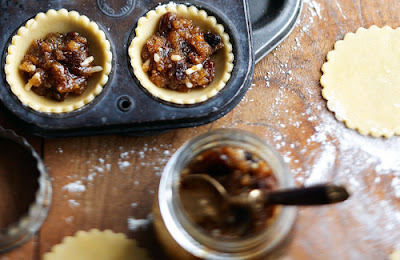 So here it is, my recipe for traditional, Christmas, English mince pies. Preheat the oven to gas mark 6, 400°F (200°C). To make up the pastry, sift the flour and salt into a mixing bowl and rub both the lard and butter into it until the mixture resembles fine crumbs. Then add just enough cold water to form your mix into a dough. You will know when it is ready as the dough will contain all of the mix leaving the bowl clean - your pastry is now ready. Leave the pastry to rest in a polythene bag in the refrigerator for 20-30 minutes, then roll half of it out as thinly as possible and cut it into two dozen 3 inch (7.5 cm) rounds. To get the most out of your pastry do forget to gather up the scraps and rerolling. 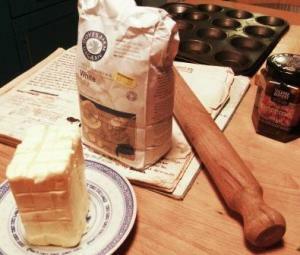 Then do the same with the other half of the pastry, this time using the 2½ inch (6 cm) cutter. Now grease your small cakes tins lightly and line them with the larger rounds. Fill these with mincemeat to the level of the edges of the pastry (this is the point at which a sneaky shot of brandy/rum into the mincemeat - but not too much as the mix will end up sloppy). Now dampen the edges of the smaller rounds of pastry with water and press them lightly into position to form lids, sealing the edges. Brush each one with milk and make three snips in the tops with a pair of scissors. Bake near the top of the oven for 25-30 minutes until light golden brown. Cool on a wire tray and sprinkle with icing sugar. When cool, store in an airtight container. Once cool, your Christmas mince pies are ready to serve with cream, custard or on their own.